At Hills of Devon we aim to provide excellent products along with a great service at the same time as fantastic prices. We offer our customers a free 2 – 3 day delivery service on all wire netting, chicken wire, aviary mesh and welded mesh although Express Delivery is available and this option can be chosen in your shopping cart. We also offer free delivery on some of our thatching materials and our new Chicken Runs. All orders received by 10:00am will be dispatched that day although we try and prepare orders for dispatch up until the time the courier have made their collection for that day. If you would like confirmation of when your order will be dispatched please feel free to telephone us on 01837 83704 and we will be more than happy to help you. Deliveries are made during normal business hours Monday to Friday, excluding public and bank holidays. Timed and Saturday deliveries are available at an additional cost. Please contact us for a quote. 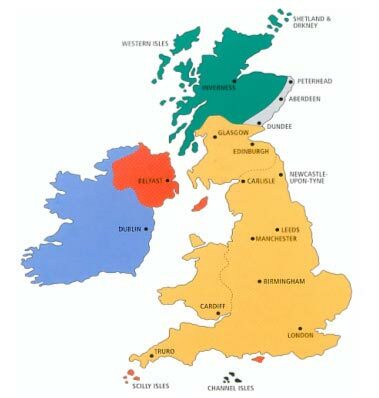 Free Deliveries apply to Mainland England, Wales and Southern Scotland (all the beige and grey areas on the map). For all other areas, including the postcodes below, please email for a delivery price. Hills of Devon makes every effort to ensure that your goods arrive to you within the specified delivery times using a national delivery courier. However, due to factors outside our control, our delivery service times are not guaranteed. Goods may be delayed once handed to our courier. If you have not received the goods by 18:00 on your scheduled delivery day please feel free to email or call us and we will be happy to look into the delay. All deliveries must be signed for by the customer or by a person acting on behalf of the customer. Customers requesting parcels to be left without signing do so at their own risk. If you wish to return a parcel(s) for any reason you must contact us first.